AP DSC Recruitment Notification 2018 - Apply Online for 7729 SGT, SA & Other Vacancies in School Education Department, AP DSC, Andhra Pradesh on Direct Recruitment through TRT & TRTcumTET. Online Applications are invited by Commissioner of School Education Office, Government of Andhra Pradesh through District Selection Committee from 01 Nov 2018 to 16 Nov 2018 for 7729 vacancies. 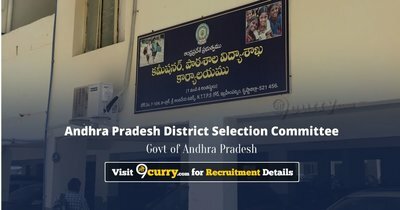 AP DSC SGT Admit Card 2019: Andhra Pradesh District Selection Committee has issued the Admit Card on 18 Jan 2019 for Andhra Pradesh District Selection Committee SGT Exam 2019. Eligible candidates may apply online at Not Available's website (direct link is given below) from 01 Nov 2018 to 16 Nov 2018. Candidates log on to https://schooledu.ap.gov.in/DSENEW/.